Rachel captured this moment while trying to get a photo of all of the VanBreda grandchildren at Hendrik's baptism. Can you spot the matching people? Last night we had dinner with the Speelmans for the first time in almost three weeks - that might be almost the longest that we've gone without dining together in the past five years! Josh got to meet his new little playmate (pronounced something like "Henrrrk"), though when given the choice he preferred to sit and hold Izzy rather than the baby. While Josh, Izzy and I were sitting on the couch, Josh reached over slowly and placed his hand on mine, and stroked my hand with his thumb. What a smooth, handsome little guy. He told his mom yesterday that I was his friend, and when questioned by his dad on multiple occasions, he admits that I'm his favourite Aunt. What's not to love? It may not look like it, but our little b's hair is already getting lighter - I think that he may be a blondie after all. 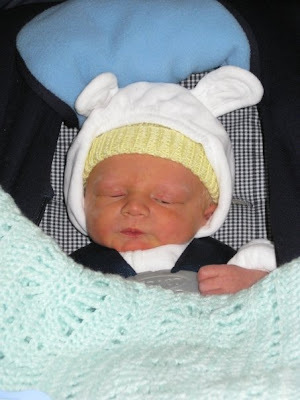 This is the outfit that 'Grandma' Margaret made for him before he was born. It's pretty cozy. Hendrik was passed out on Izzy's spot, so Izzy figured that she might as well cozy up to him. If you can't beat 'em, join 'em! Here's my little man at a week old. He's sporting an adorable hoodie that was handed down from his Renkema cousins. Below, a photo that I took two years ago of little Liam wearing the same sweater.